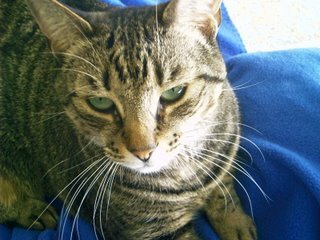 Mandy, our sweet kitty, died last evening. Sean and I were with her ~ it is one of those things that you hate to watch but that you know you shouldn’t miss. After all, she loved being with her family and brought us lots of joy and kitty snuggles. She was an awesome cat and we will miss her. It was hard to see her deteriorate, but that is not how we will remember her. It will be like this. I am sorry about Mandy… Those cats certainly have been a journey of a lifetime with you!!!! I can still little Miss No Nappin, dressed in her underwear, chasing those cats around and grabbing their tails…..all the while screaming at the top of her lungs…. So sorry to hear about Mandy. God, I remember when you 1st brought her home, just like yesterday! Seems like everything else is moving along nicely for you guys. Sorry about Mandy. She was great.